A petition calling for water justice has been accepted as the first European Citizen Initiative. A European citizens’ initiative is an invitation to the European Commission to propose legislation on matters where the EU has competence to legislate. There’s reason for hope that this petition will result in an actual policy shift, although much more water will need to flow to the sea before that happens. 1) The EU institutions and Member States be obliged to ensure that all inhabitants enjoy the right to water and sanitation. 2) Water supply and management of water resources not be subject to ‘internal market rules’ and that water services are excluded from liberalisation. At present, 2 million EU citizens do not have proper water or sanitation. Worldwide 800 million people still lack access to water and over 2 billion people do not have access to sanitation. The petition claims that Europe can and should do more. It urges the EU to stop all its current efforts to privatize water services – a condition currently used by the Commission for giving loans to countries such as Greece and Portugal. Mainstream media are picking up their story and the pressure to withdraw such conditions is rising. 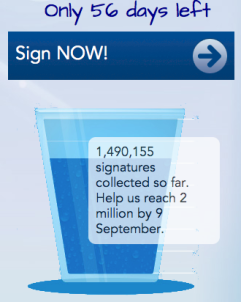 Even before the signatures are handed in to the European Commission, in 56 days from now, the European Citizens’ Initiative on water as a human right has achieved a first political success. Commissioner Barnier has announced that water will be excluded from the concessions directive. However, the struggle is far from over. This ECI does not only address the way water services should be provided, but it addresses first and foremost the lack of water and sanitation for so many citizens. This campaign is a means of getting a commitment to the human right to water and sanitation. It is a tool to change the mind-set in the European Commission from a market-based approach with the focus on competition to a rights-based approach with the focus on public service. It aims to achieve universal (global) access to water and sanitation and to safeguard the limited public water resources for future generations. Many millions of people continue to be deprived of clean, safe and affordable water and sanitation, even in Europe. The European Commission can do something about it and it now seems likely that they will do something about it in some policy cycles – but how far will they go and will it be enough to halt the current privatization trend? The more signatures collected, the more pressure to stop this madness so if you have not signed yet – you can do this until September 9 by signing here.